My darling chocolate fudge cake, it has been a while, hasn't it? 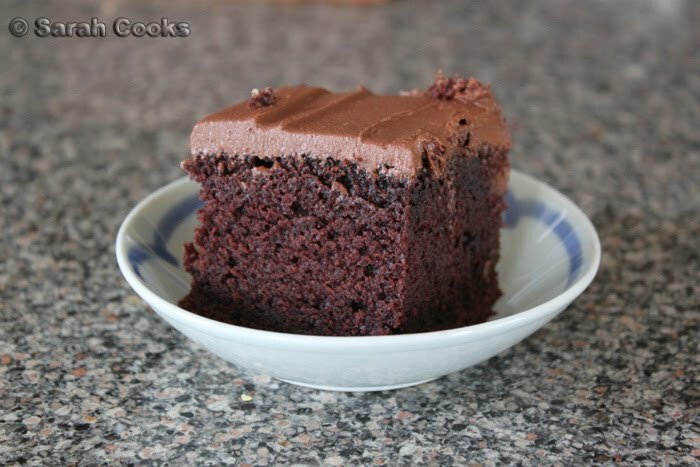 Nigella Lawson's chocolate fudge cake, from Nigella Bites, is my favourite chocolate cake of all time. 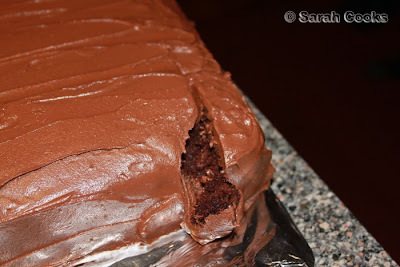 Moist, rich cake, slathered with light-tasting, fudgy chocolate icing. Heaven. I made it (in triple quantities!) for my 21st birthday, and I've made it a zillion times for my buddies Allstar and Liam, who happened to do my 21st b'day speech. What legends! Yesterday, I baked it for a rather massive house party we had to celebrate my bro's bday. 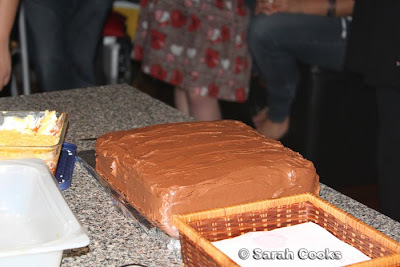 I baked the cake in the morning, iced it in the arvo, and we all ate it in the wee hours of Sunday morning. 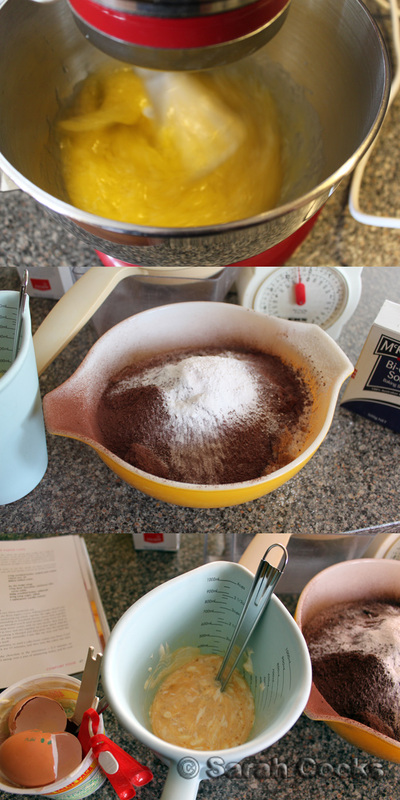 The recipe is here, so I'll just give you the gist of it. 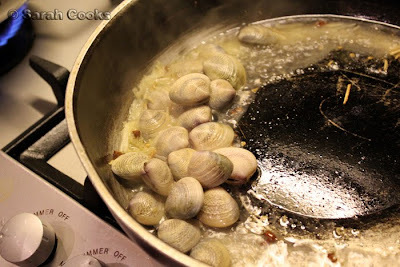 So, in short: you mix melted butter, oil and cold water, then pour in the dry ingredients. (Flour, cocoa, sugar etc etc.) Finally you add a mixture of eggs, sour cream and vanilla extract, and beat gently until smooth and glossy. Those of you who have been with me for a while will know that I usually bake this in 2 x 20cm round sandwich pans, making an epic double-decker cake of decadent deliciousness. 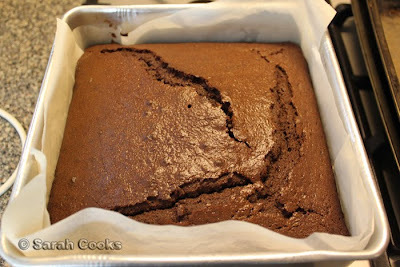 However, in the interests of sharing it amongst many friends, this time I baked it in a 30cm square tin. It took 1 hour at 180C to cook through. It smelled so good! Once it had cooled down a bit, I roughly hacked off the domed top to smooth it out. 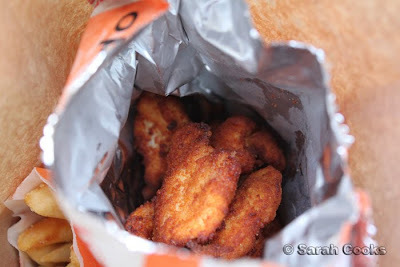 And we also got to eat the delicious crunchy offcuts, muahaha. Of course, I say "once it had cooled down a bit", but when I removed the top there was still steam coming out of it. Hahaha, I guess we were really keen to get stuck in! 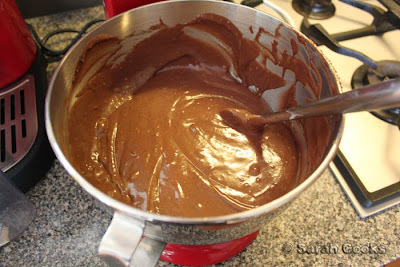 The icing is quite easy to make - beat butter until soft and smooth, add icing sugar, melted chocolate and vanilla essence. I always beat the butter and vanilla together; many years ago I had an incident with the chocolate seizing on contact with the vanilla. I passed it off as "choc chip icing", but it really wasn't the same. 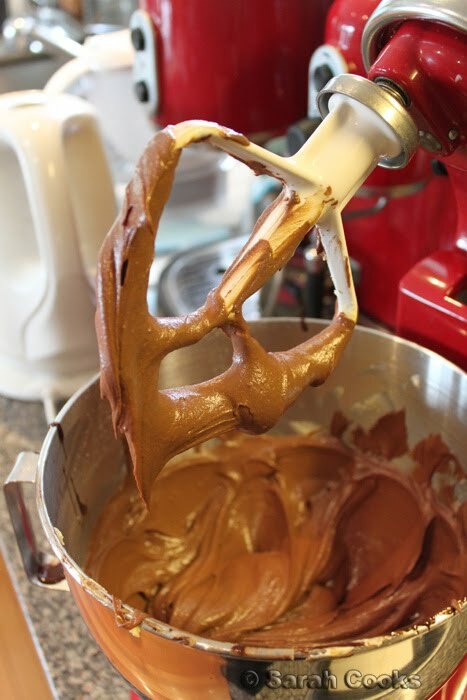 I love buttercream icings so much more than ganaches, which tend to be too dark and throat-clogging for my liking. A simple decoration belies the utter fabulousness of this cake. 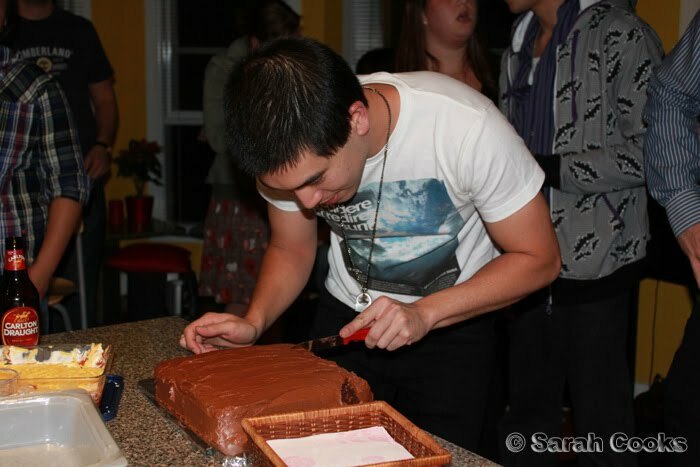 Here is my bro cutting the cake! 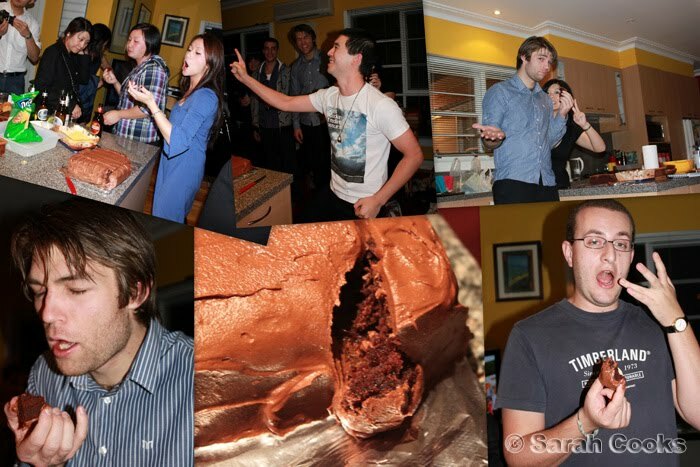 I noticed that everyone does the same "cake-eating" face: mouth open, chin pointed slightly. It's also been a while since I've put quotes in my blog! So here we go! Chrissie F: That chocolate cake was AMAZING! 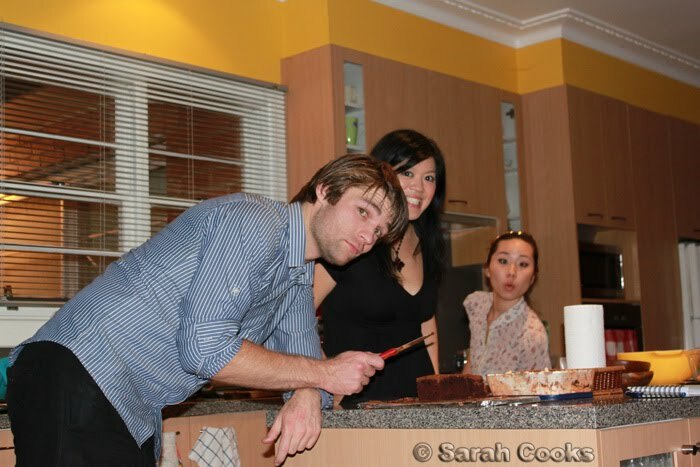 Kristine P: mmmm that was some good cake.. i wanted to have some time alone with that cake and show it a good time! The next morning, I gratefully awoke to a quiet and empty house, and saw this on the kitchen bench. 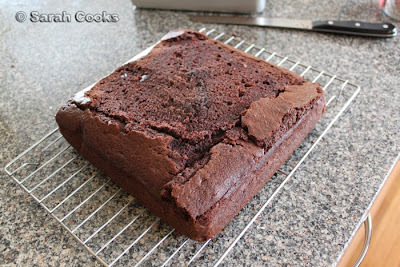 One small square of cake!!! SCORE!!! So, Sydney was great, but I am truly, madly, deeply a Melbourne girl. On Saturday night we went out to celebrate my bro's girlfriend Su's birthday. First stop, a dingy laneway bar, followed by late-night Chinatown supper! You can't get more Melbourne than that! Well, it was only going to be a matter of time before I made my way to the new German-themed bar in Melbourne. Berlin Bar is on Corrs lane, right next to Eurotrash, and you have to climb some stairs and ring a bell before someone lets you in. Our waitress was super-nice and friendly, but apparently the guy who let Su in had a bit of an attitude. Incidentally, we found that lots of the waiters were French, and we didn't spot any Germans. (Not a big deal, obviously, just interesting to note). 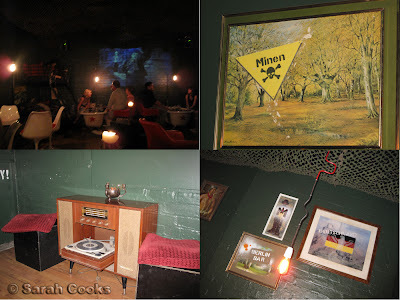 The bar is split into East and West Berlin, with appropriate decor. We sat in "East Berlin". Our table was a bathtub, there were bunk beds and ammo boxes around, and The Great Dictator was (rather anachronistically) projected onto one of the walls. It was table service only, and for some reason the drinks list that we got was much more limited than the website. 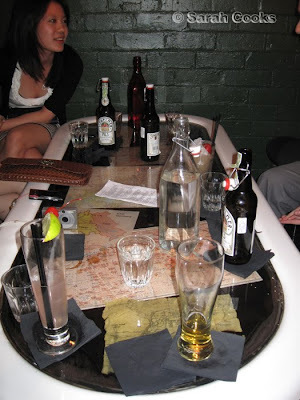 Either way, there were some cocktails, and a good selection of German beers. (Sadly, the Feuerzangenbowle didn't appear to be available). Unfortunately the cocktail list isn't available on the website, so I am going from memory here. Apologies if I've missed any ingredients! Of the cocktails we ordered (most of us were drinking beer), my faves were the Love Parade and the deliciously grapefruity Funkturm. 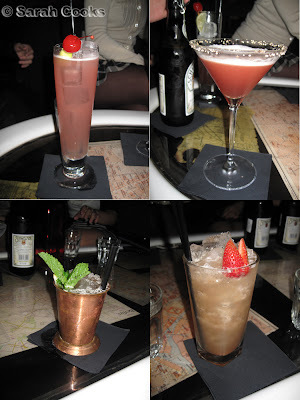 However, I can't say that the cocktails blew us away - there are heaps of bars in Melbourne that do a larger range of cocktails, at similar prices, but better quality. (Match, Toff's and Polly spring to mind, although I'm sure there are many more). I also prefer Champagne or vodka-based cocktails, and they didn't have too many of them here. I was going to go to Berlin Bar for my birthday this year, but I'll probably choose somewhere else now. Although, if they start serving German-themed bar snacks, I'd be back in a flash! As usual, all that drinking makes you hungry, and at around 2:30am we were feeling peckish. 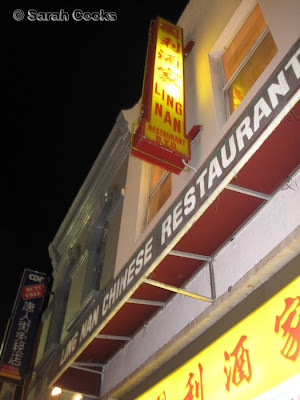 Luckily for us, it was a very short walk down to Ling Nam for supper. 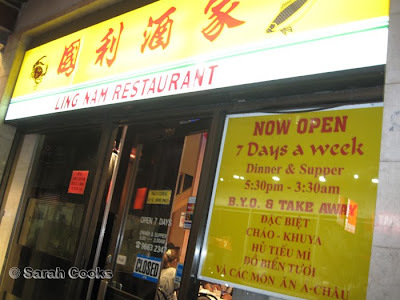 We always seem to end up at Ling Nam after a night of drinking (which actually doesn't happen that often for me; I'm a responsible adult now!) It's my favourite CBD supper place. Yes, I like it more than Supper Inn - gasp! And, it's open til 3:30! 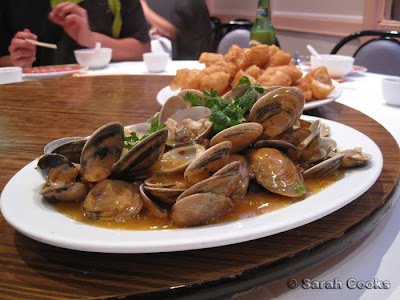 Clams in XO sauce with Crullers - It's a house speciality, I think. 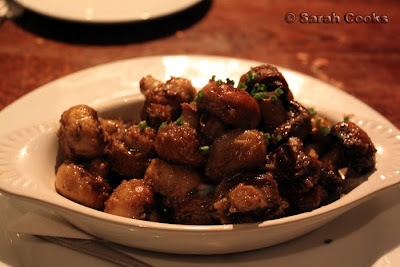 Every table seems to have a plate of these, and I've never seen this dish at another restaurant. 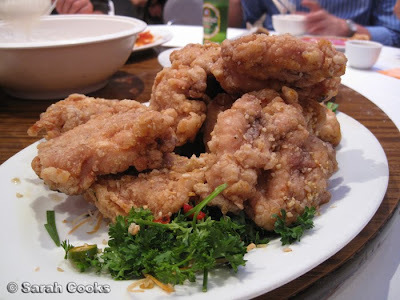 Double serve of deep-fried chicken ribs with salt and chilli. Crazy-strong with the MSG but still tasty! 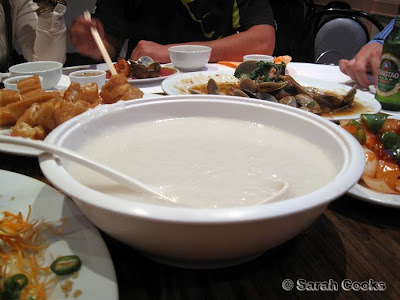 Massive bowl of plain congee to share. Sweet and Sour Prawns. 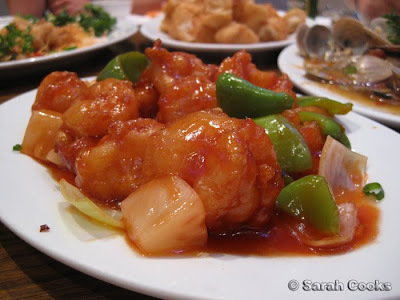 Yes, we teased Justin that he was being really Aussie ordering sweet and sour prawns, but by god these were good! 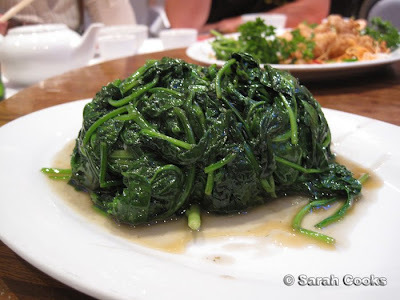 Stir-fried spinach. Because green vegetables will cancel out all the alcohol and fried food, yes? Delicious. 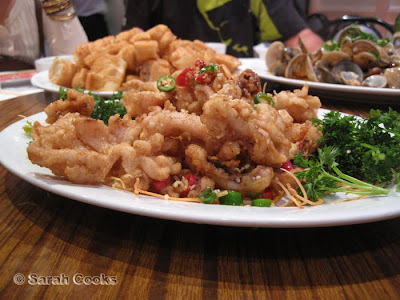 Double-serving of salt and pepper calamari. Oh yes. And that, my friends, is one of the reasons why I love Melbourne. 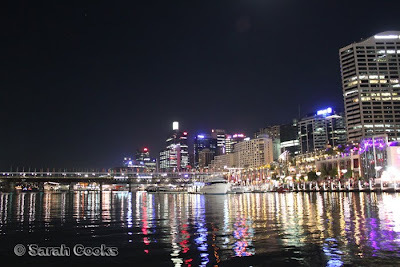 Welcome to the final in my series of posts about our trip to Sydney. It was quite an effort to fit all these foodie destinations into one weekend, but by gum we did it! 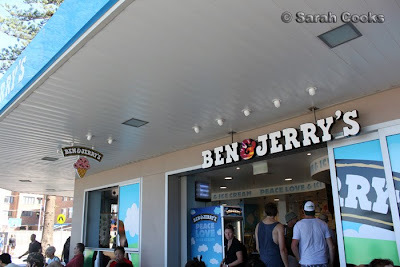 One of my must-visit destinations was the Ben & Jerry's scoop shop in Manly. 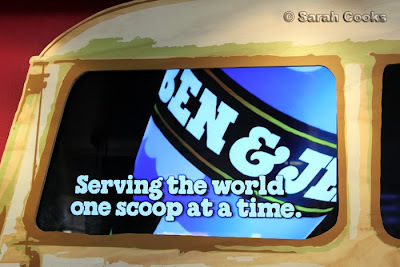 I'm not sure why I've become so obsessed with Ben & Jerry's. Maybe it's because of their strong yet non-preachy commitment to social justice. Maybe it's because they seem like super-friendly happy stoner hippies. 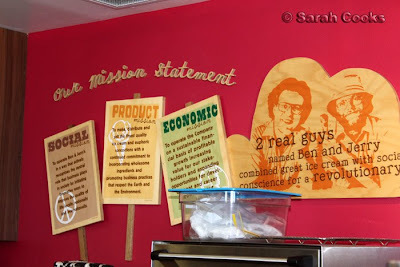 Or maybe it is because they are 2 normal guys who built an ice-cream empire out of their living rooms. Manly seemed like a really nice area; close to the beach with lots of shops and eating places. I would have liked to spend more time there, but we were on a limited schedule and had only one place in mind! It was busy, but luckily there wasn't a long line. 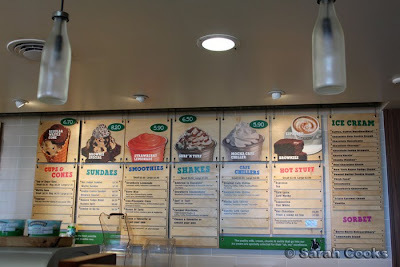 If we'd had more time, I would have sat down and had a sundae, but we were in a rush to get back to Oxford st. The ice-creams were quite pricey, but very, very generously served. 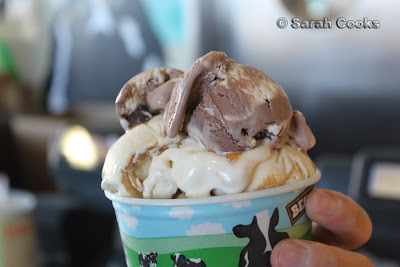 I had a waffle cone with Chunky Monkey and Peanut Cookie-Burra Dough. I didn't get a photo of it, but trust me. It was massive. Even I struggled to finish it. 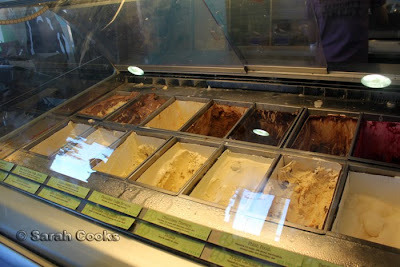 The ice-cream was a little meltier than ideal; we had a look at the freezers and they were at 5~6C! Probably because the freezer doors are always open due ot the high business volumes. 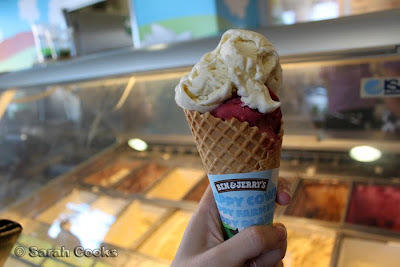 Sandra's cone: Vanilla and Berry Berry Extraordinary. I normally don't rate B&J's fruit flavours, preferring the crazy-chunky-rich ones, but the berry sorbet was lovely, with a pure berry flavour. An, that crazy boy, had a triple scoop. I can't remember what he ordered, but one of them was a coffee-based flavour. I can now say my ice-cream craving is well and truly satiated! I know, I know, Oporto isn't really a foodie destination, but they are a Sydney chain. We shared some nuggets and chips as a snack. 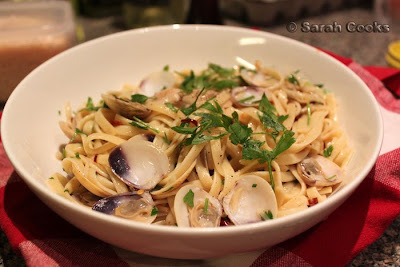 (Sometimes after a big sweet hit, you need something salty and savoury to cut through it, hehe). The nuggets were made with real chicken breast, but for some reason had a super-strong lemon flavour. I think I prefer the processed KFC nuggets. Does this make me a bad foodie? 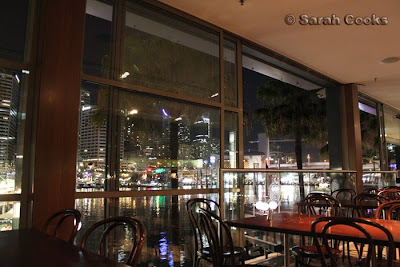 And later that night... our friend Diane took us to Darling Harbour for ribs. Doesn't it look pretty at night? I like the fact that things in Sydney tend to stay open quite late. 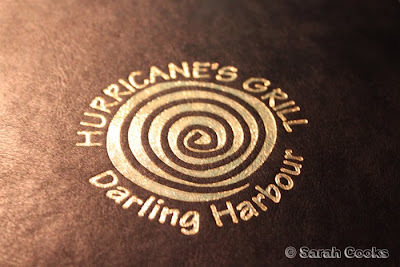 For example, on the Friday night, people were still coming into Spice Temple for dinner at 10, and on Saturday, we didn't get seated at Hurricane's until 10:30. We were worried about how our friend Di would get home, but apparently the last bus is at 4am, so we didn't need to worry! 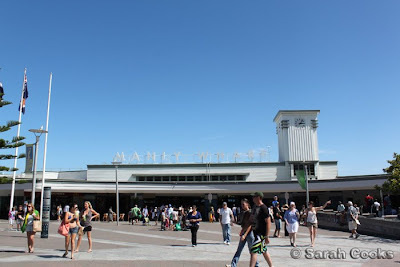 (I wasn't sure if the late opening hours were just for Mardi Gras weekend, but according to Sydneysider Di, the city is usually pretty crowded most weekend nights). 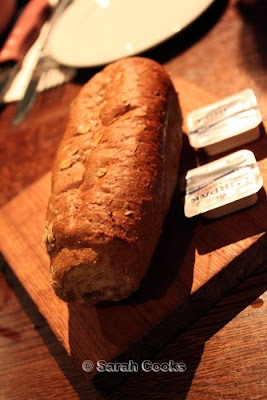 Bread with lurpak butter. (I'm such a butter dork, I was impressed by the good butter). 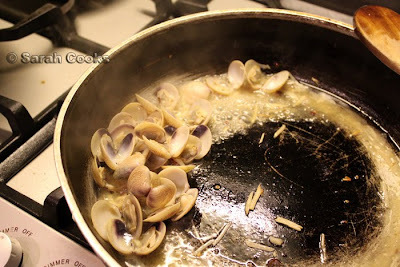 Garlic mushrooms - $11. Super garlicky, super buttery. Yum. 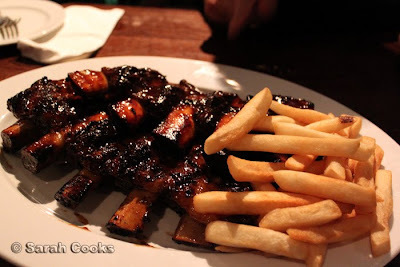 We shared the full rack between the 3 of us, which was a good amount. 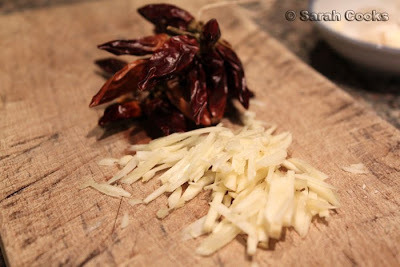 I loved the sticky, sweet, salty sauce, and found the meat juicy and tender. They gave us bibs to wear, which were dorky but necessary. I am a messy eater! 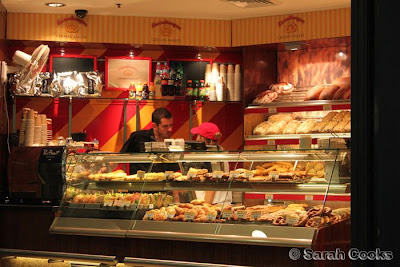 Sandra: "That bakery looks very German." I had to be stopped from buying EVERYTHING in the cabinet. 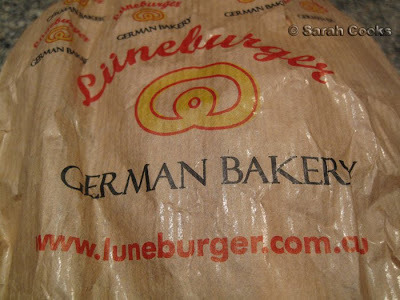 Lüneburger QVB primarily does takeaway, but there are a couple of tables outside, so we sat down to eat. My latte was better than expected - a good temperature and not burnt or overly bitter. 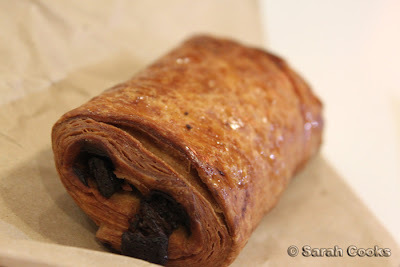 Chocolate croissant - I ordered this one because they just came out of the oven. Warm and fresh, but the dough was slightly heavier than what I'm used to. An had a "strawberries and cream" pastry, which I think was even nicer than the croissant. PRETZEL!!!!!!! 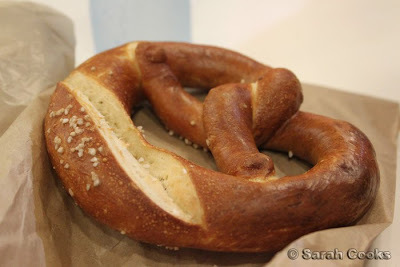 Sandra said these were better than the Bretzel Biz pretzels that we get in Melbourne. I should have bought a dozen to take home and freeze. What I did buy to bring home, though, was a Krustenbrot, or "Crusty". 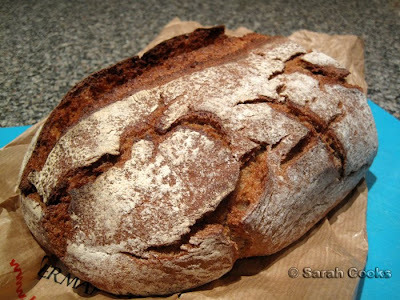 It was my favourite bread in Germany, and I was looking forward to having more. The hard thing about transporting bread is that it gets soggy if wrapped up in a paper bag. By the time we got it home to Melbourne that evening, it actually felt soft. However, a quick flash in the toaster restored it to crusty goodness. It was great! 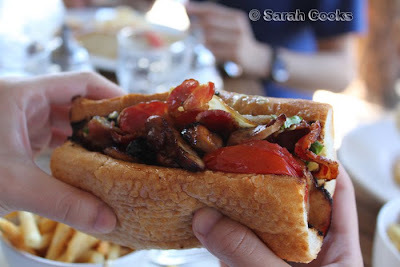 And that, my friends, was our foodie weekend in Sydney! Time to start saving up for the next interstate weekend trip. 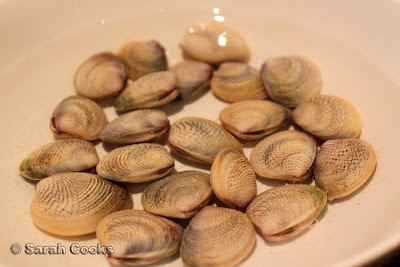 Does anybody have a favourite foodie destination in Australia? 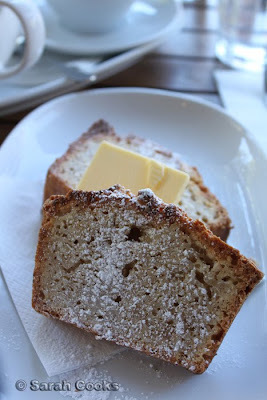 For me, a trip to Sydney is not complete without a trip to one of Bill Granger's cafes. (See previous posts for example: bills 2 in 2005; bills 1, 2 AND 3 in 2006). We came here on a Saturday morning at about 11:30. It was a short but strenuous walk from Central station - Googlemaps doesn't show you just how hilly Surry Hills is! As usual, it was packed, and we had to wait 40 minutes for a table. The captain was really nice, and kept apologising that the table before us just wouldn't leave, even after they'd paid their bill! Grrr. Anyhoo, after a wait in the nice warm Sydney weather, we got a table outside and promptly ordered. You'll have to forgive me; I've forgotten what all the prices were, and I have misplaced the receipt we got. Overall it was pretty decently priced by Sydney standards, which translates as "moderately expensive" by Melbourne standards, hehe. ... but unfortunately didn't taste too good. The coffee was neither rich nor full bodied. 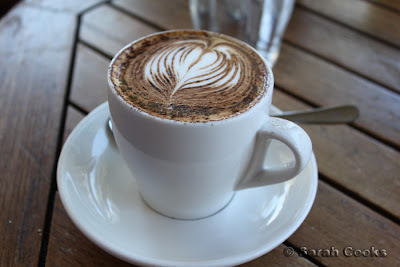 I guess we are spoiled by the quality of coffee here in Melbourne! By this time, they had stopped serving breakfast, but luckily for us there is a section on the menu of "bills classics", which are available all the time. The first 3 dishes are all bills classics, and for non-Sydneysiders, the recipes are all in Bill's first book, Sydney Food. 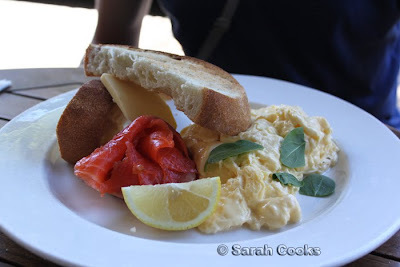 Scrambled eggs with toast and smoked salmon. (Portions seem to have gotten smaller since last time - our boy Dan reported he was still hungry afterwards). Coconut bread - a light meal for Sandra, who wasn't up for a big lunch. She reportedly liked the bread, but I tried a bite and foud it slightly heavy for my tastes. 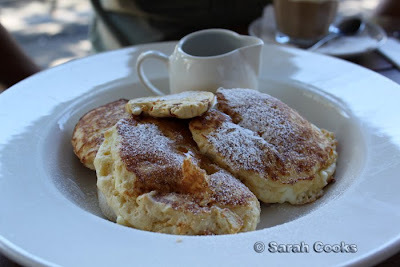 An's favourite: ricotta hotcakes with banana and honeycomb butter. AHEM. What a plate of awesomeness! Both myself and Di ordered a chicken club - chicken, bacon, tomatoes, rocket and avocado mayo on baguette. Sounded great, and looked pretty good too! Unfortunately, it was one of the greasiest sandwiches I have ever eaten. When I picked it up, the bottom half of the bread was all soaked through with grease and kinda disgusting. 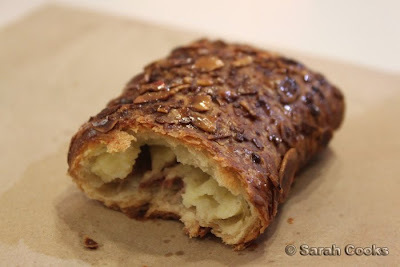 That was mine, but Di's was the same - soaked through with bacon/chicken grease. 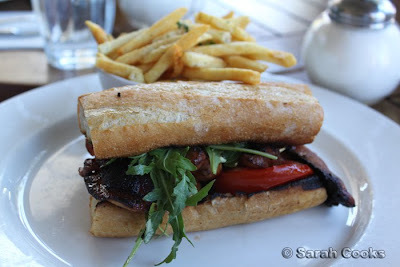 It didn't help that the bread was pappy, soft and white, not the robust crunchy baguette I was hoping for. After such a long wait for our table, I didn't want to send it back. I just ate the filling and the top piece of bread with a knife and fork. I should so just have ordered a cake from the counter, or the hotcakes! 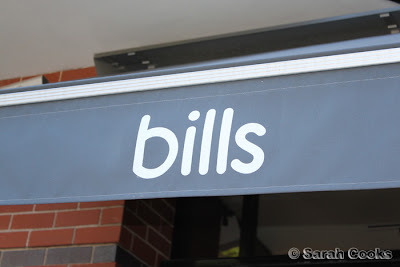 Bills 2 seems to have dropped standard slightly since our last visit, but it is still worth a visit for the echt Sydney experience. My recommendation though, is to get there early, and stick to the classics!